Home » News » Cortney Cunningham, MPSF Freshman of the Week! 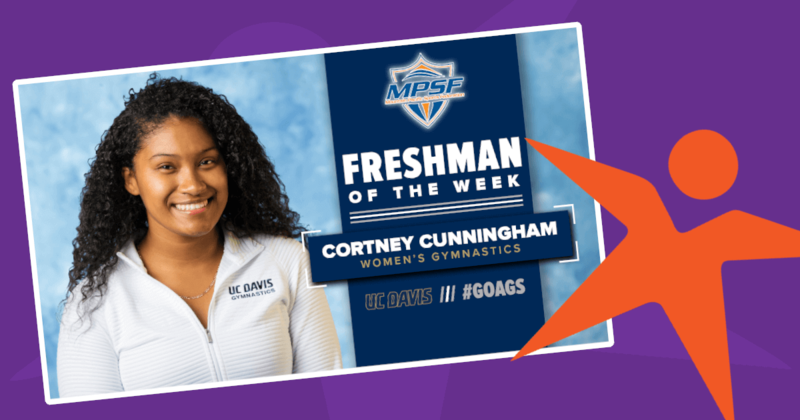 Cortney Cunningham, MPSF Freshman of the Week! Cortney Cunningham, Pacific West Gymnastics alumna, has been named the (MPSF) Mountain Pacific Sports Federation Freshman Athlete of the Week. The recognition came after her collegiate debut for UC Davis at the NorCal Classic! The human development major from Hayward, California, and Pacific West Gymnastics made her collegiate debut in Sunday’s NorCal Classic at Sacramento State. She hit a 9.750 on vault to help the Aggies to a 48.750 team total, plus a 9.575 on uneven bars in the meet’s opening rotation. While at Pacific West Gymnastics, Cortney earned multiple 1st place awards in addition to competing at numerous State, Regional and National Championships. After competing with Pacific West Gymnastics for many years Cortney was offered a scholarship to UC Davis and joined their gymnastics team in the Fall of 2018.